The leopard belongs to the cat family - so imagine a giant, smooth-haired domestic cat with spots and you have an idea of what a leopard looks like! The background color of the coat is tan and this can vary from very pale to quite dark. The head, neck and legs are covered in black spots, with more intricate markings, called "rosettes", on the remainder of the body. Each rosette is made up of three or four black spots on the outside with a yellow-brown center. 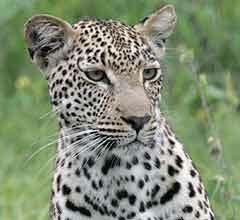 The leopard's underparts are white with black spots. The long tail is also white underneath with rosettes on top. No two leopards have the same markings or color. 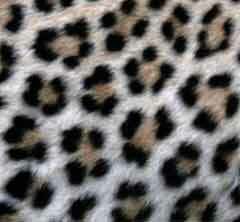 In fact each leopard's spots are unique, similar to human fingerprints. Other distinguishing features of this spectacular cat are the large head, powerful neck and shoulders, and short, muscular limbs. The leopard - stealthy, cunning and adaptable - is the ultimate cat, able to live in a wide variety of habitats, from semi-desert to tropical rain forests. Because of this versatility, it is the most numerous of Africa's big cats. Leopards are nocturnal, hunting by night while spending most the day resting, usually draped on tree limbs or lying in thick undergrowth. As a result they're difficult to see, unless you're lucky enough to spot one resting or sunning itself on a rock or tree limb. Once darkness sets in, they move around intermittently until after dawn. Adult leopards are solitary and territorial and will only associate long enough to mate. Occupation of a territory is advertised by marking with urine and faeces and clawing the bark of trees. Although they are solitary animals and do not live in families, leopards nevertheless have strong maternal bonds. Even though the young become independent at about 22 months, the mother may continue to share kills with her offspring until they become totally self-sufficient. The leopard is classically feline in its hunting behavior, specializing in ambushing and stalking its prey, then pouncing before the victim can react. With its head low, legs bent and belly nearly touching the ground, a leopard will try to stalk to within three to 10 meters before pouncing. If it misses, it will seldom chase its prey. After a successful pounce, the leopard paralyses its prey with a bite through the back of the neck that damages the spinal cord, then strangles the victim with its powerful jaws. Usually the kill is then taken by the neck and dragged to safety, away from other predators. 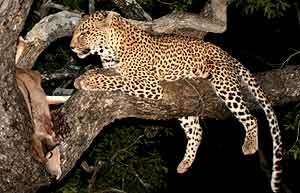 Leopards often store their kills in trees, out of the reach of lions and hyenas. This requires great power, but is not a problem for leopards - they are renowned for their strength and can haul a carcass of at least their own weight up the vertical trunk of a tree. Generally leopards will eat any warm-blooded prey, from mice and hares to large antelope. 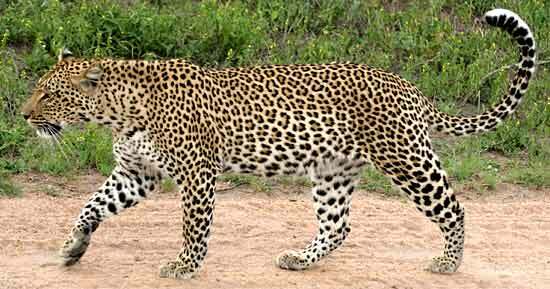 But a leopard is the supreme opportunist and will also eat birds, reptiles, rodents and even insects. If living close to people, it will also attack domestic animals and pets such as dogs. When there are no large predators or vultures in the area, a leopard will leave its kill on the ground covered with loose soil or leaves. Otherwise it will carry its prey up a tree. 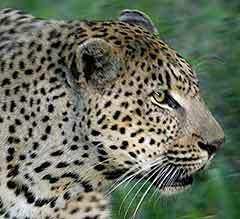 Leopards will also scavenge if necessary, stealing kills from cheetahs, lone hyenas and any of the smaller carnivores. Excess food is stored to be eaten later and leopards have been observed killing again before the first carcass is completely eaten. A female leopard on heat attracts males by the smell of her urine. A male and female may stay together for several days, even sharing food, during which time they mate repeatedly before going their separate ways. Females are capable of breeding at two years and will produce litters of one to three cubs after a pregnancy lasting about 100 days (three-and-a-half months). Leopard babies weigh around 500g at birth and their eyes open after a week. 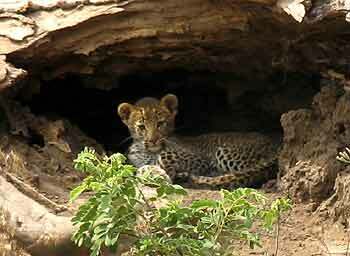 For the first two months the mother keeps her cubs hidden in dense bush, rock clefts or hollow tree trunks. The cubs will venture from hiding after six to eight weeks, by which time they can already climb trees. The mother will leave young cubs for up to 36 hours while hunting and feeding before returning to suckle them. She brings solid food to her cubs when they're about six weeks old. The cubs are weaned at three months, but will stay with the mother for the first 22 months. Only half the cubs from a litter will on average survive to adulthood. Leopards have a distinctive call that sounds like a wood plank being cut with a saw. The sawing sound is repeated at intervals of six minutes or so during the peak calling hours which tend to occur in early evening or before dawn. 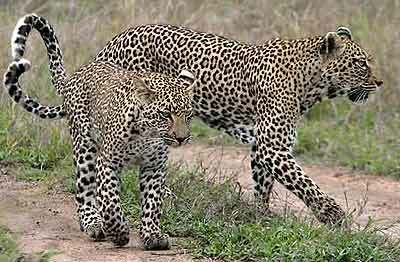 The leopard's call allows territorial neighbors to keep out of each other's way and also allows males and females to find each other. Other sounds that leopards make include growling when aggressive, spitting and snarling when threatened and purring when contented.